In Autumn 2014, WB’s Harry Potter Studio Tour unveiled a new section devoted to the Dark Arts, encompassing Horcruxes and other sinister wizarding artefacts, in their first permanent addition since opening. The Malfoy Manor fireplace has been expanded to showcase the full set which became the headquarters of Lord Voldemort’s followers, the Death Eaters, in Harry Potter and the Deathly Hallows – Part 1. You can now to peer into the drawing room that features ornate chandeliers, an imposing fireplace and the long, grand table around which Bellatrix Lestrange, the Malfoy family, the Death Eaters and Voldemort sat and complete with a mannequin of captured Muggle Studies teacher Charity Burbage. The new section includes a variety of never-before-seen artefacts and props from Borgin and Burkes, the Knockturn Alley shop Harry accidentally stumbles into in Harry Potter and Chamber of Secrets. You’re now able to see these weird and wonderful props up close, including the mysterious Hand of Glory and the Vanishing Cabinet. A section of Dolores Umbridge’s Ministry of Magic office, including her garish kitten plates, perfectly putrid pink costumes and desk, are also on display as well as Defence Against the Dark Arts professor Remus Lupin’s costumes, magical projector and gramophone. 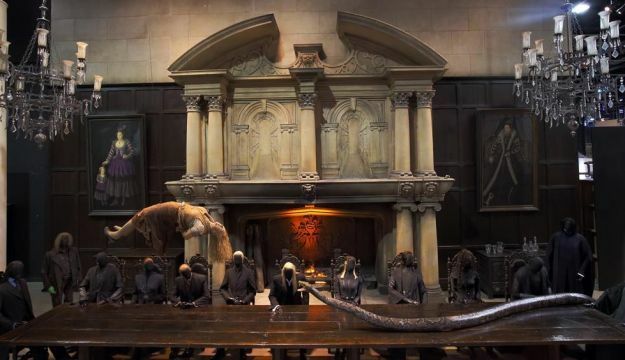 Taking centrepiece of the original Malfoy Manor table is a life-like 20-foot model of Voldemort’s snake Nagini. Prop makers from the Harry Potter film series recreated the snake using a painstakingly detailed two-week modelling process. They injected rubber into a mould to create the snake’s outer shell and then painted each scale individually with a latex-infused coating. Finally, a metal skeleton was inserted to give the snake a life-like posture and the model was lacquered using the same outer coating that is used on most cars, giving it a reptilian sheen.